ok! so i finally got a chance to get to making this long awaited writeup. this was all made possible by PZ's awesome mechanic skills, my purchase of the ZF 5hp-19-FL/FLA rebuild repair manual (available at www.bulkpart.com for $75), and of course, Xyro's broken car. this was done with the recommended pan drain and refill, just as a while you're there, kind of maintenance. i'l begin by apologizing immediately for some of the picture's quality. i have tourettes, and my hands shake, but you can get the very concise general idea of what's all going on. i tried to make it as clear as possible. Now then! onward to the broken stuff! before any steps are taken, i HIGHLY recommend following pz's example by reading everything before digging in. 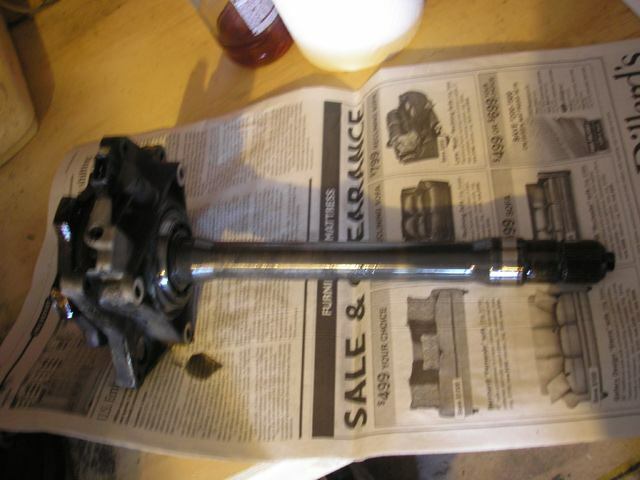 ALSO purchase the wheel/axle hub bolt, as you WILL be removing the axle, and this IS a stretch bolt. I do not have the part number off hand1, but any dealership would be willing to give you that number no problem. it's a very specific car part remember,this is for the b5.5 ONLY! the b5 has a different mounting of the axle on the transmission. ALL of these parts are DISPOSABLE pieces that must be replaced as you dig down into there. the bearing, is not so much needed to be replaced, and seeing as how it's ~$50-70 for this you may not want to, but i highly recommend replacing it while you are there. there's not going to be another chance later down the line, until the seal blows again. here we have the book's actual exploded diagram of what all we're going to be digging into. think of this picture as you in front of the car a little of to the side, staring into the drivers fender, and downwards at the trans. the next step is to remove the tire. some people find it wise to have loosened the lug bolts while the car is still on the ground (NOT REMOVE THEM!) just to get that leeway, but as we were also doing a pan drop, we had the car a good foot or so off the ground, all around, and removed it by loosening them beforehand. freewheeling is a pain when removing wheels. 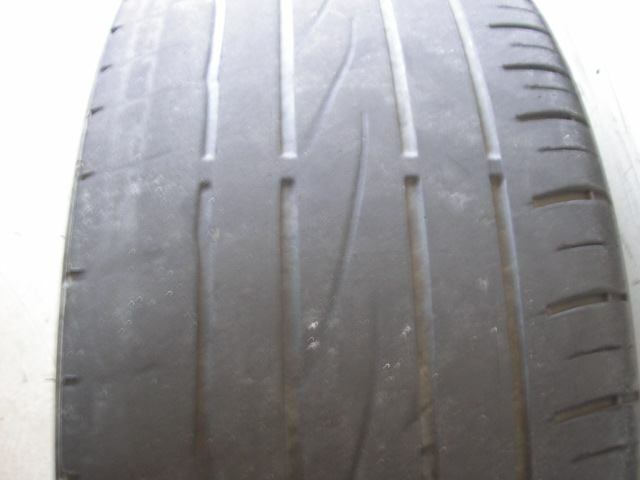 if they look ANYTHING like this, get new tires immediately, and begin a proper rotation interval. best to keep it in tune with your oil changes. now then, with the tire removed, the next step is to remove the axle hub bolt, and the axle assembly. there is a proper step to this, so please follow what i say or else you will risk separating your CV joints, which is VERY bad, and would require a boot replacement job to reassemble it. side note: go ahead and screw one of the wheel lug bolts into the hub with the wheel still of, just to keep it the holes aligned. makes reassembly much easier. loosen outer axle hub bolt, remove inner bolts attaching the inner axle end to the flange shaft and remove them, remove outer hub bolt completely now. now, pull the ABS sensor out slightly, like this. 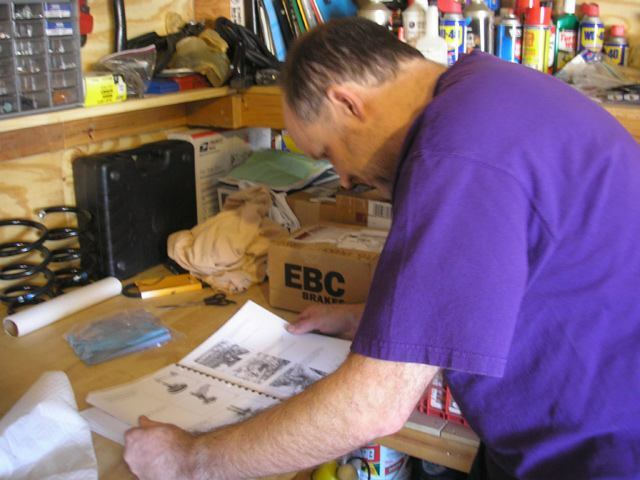 pz's addendum #1: The ABS sensor should be pulled and cleaned before final assembly. They will all have some dirt/rust on them. Better to clean it now. 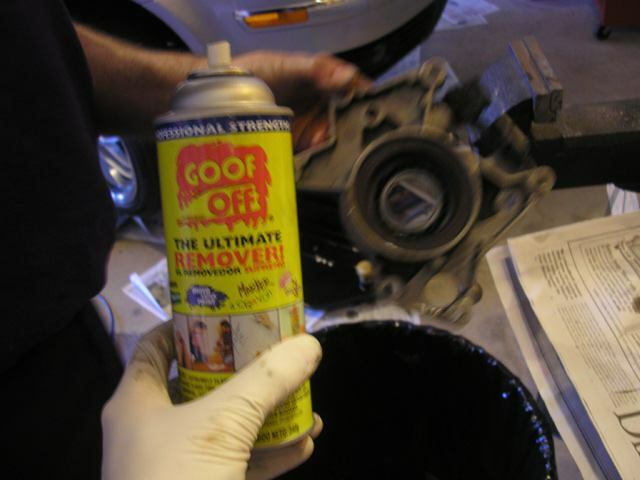 If you live in the rust belt, coat it with some anti-seize. now then, with the axle safely removed, the following step is to look down into this new dark cave you have created. what you are looking at is the driver side axle flange shaft end. 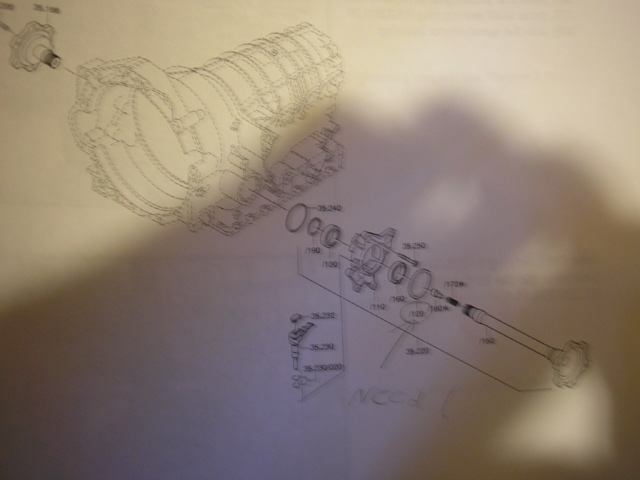 basically, all that holds the axle to the transmission is 3 t40 bolts, and… well… that's it, literally. that's all that holds the axle to the differential. this shaft actually juts all the way through and splines into the differential's gears. now, looking directly at this picture to the top left, you will notice a ire that uses one of those ever-so-famous button-wire connector clips. that's the speedometer cable. this part is what tells you how fast your car is going. surprising, eh? disconnect it. the speedometer sensor will not require removal, but it's firmly attached to the housing/assembly we will be removing for this job. the meter will not require it's removal from that housing though. it can't be damaged like the abs can, provided you watch what you're doing. now, at the bottom of the picture you should see that black cable running along the bottom of the speedometer housing, and above the subframe from view. you should see what appears to be a ziptie. cut the ziptie. i don't know what the cable is, but for the job it must be un-zipted. 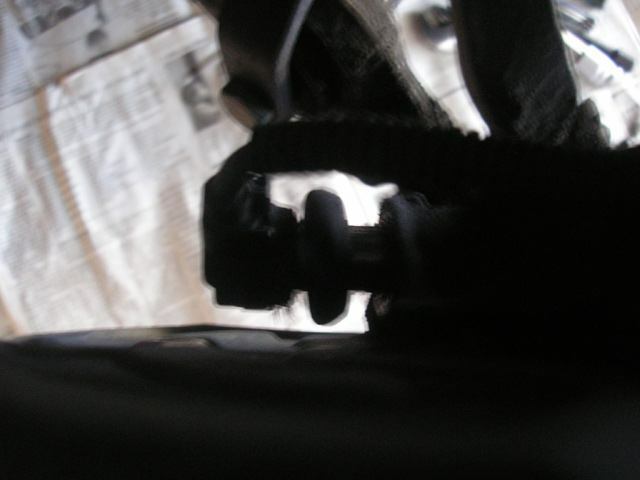 now, with those two parts unconnected from the speedometer housing there are 3 bolts that we will proceed to remove. these are regular bolts not requiring replacement, just sat aside where we WILL remember them. these three bolts are each a T-40 torx bolt. their placements are one on the left side, and two on the right side. you can see half of one in the picture above, just to the lower left of the axle flange. it has somewhat of a yellow/gold color to it in the picture, it's half-showing above. 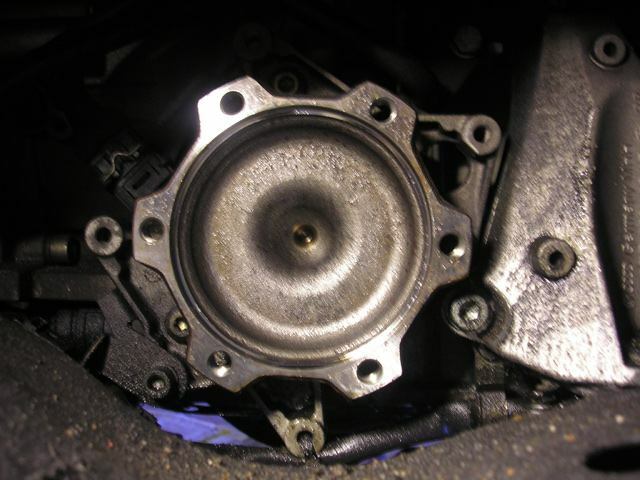 after you remove these three bolts, the speedometer housing should now be relatively loose from it's held position. pull it out part of the way, and you can spin it upside down and get it sort of over the subframe. we found that it was possible to remove this without dropping the subframe, or manipulating the engine, so you just need to find the right position, and you can yank it the rest of the way out. reinsertion will be just as difficult, so remember the position you removed it. now that you have that removed, you have the solid axle-flange-shaft-and-speedometer-housing-assembly. note that the Sobe "power" drink caught in the picture is tasty when cold, and hard at work. with that out, onward to the next step!! on the shaft end of the axle flange shaft, you will see the bearing pressed into the speedometer housing. in front of the bearing, visible by eye, there is a C-clip that retains it's position on the axle. you need to remove this C clip. do not worry about breaking this clip, as it is one of the parts to be replaced. heck, just throw the sucker away now. no further need to keep it, unless you just want to hold on to all the parts while you're working, which is actually the best idea. on the far end of the axle shaft, there is what appears to be a button. grab a good set of pliers, and pull this out. this is actually sort of a bushing that keeps the axle shaft from wearing on the pinion shaft of the differential. beneath this button there is also a small spring, grab a needle nose pliers and pull that out as well. both of these parts are also replaceable pieces with the part number above. with those 3 parts removed (button bushing, button bushing spring, and C-clip) you can now start the next step. this part can take a bit of force, and there isn't much that can get damaged by this next step. you need to push the axle shaft through the spedometer housing, and out free. the only thing holding the shaft is the bearing itself. there really isn't a specific method. even the repair manual says to "press the shaft out of the speedometer housing, but you can accomplish this with a bit of force. now, with the flange free, you should be left with the speedometer housing, with the bearing, and flange shaft seal still in place. 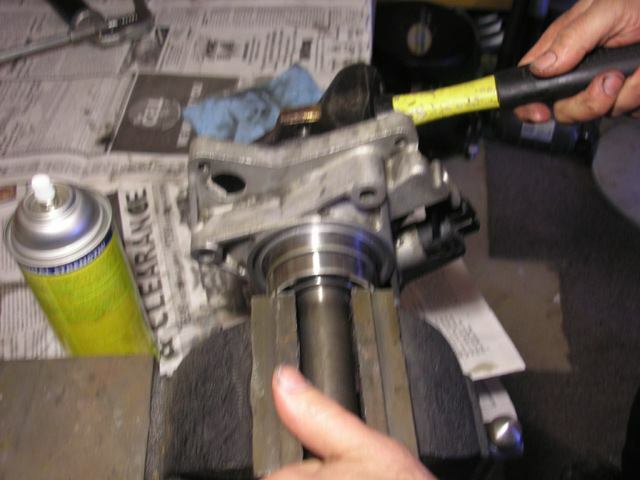 go ahead and pop the old flange shaft seal out, and set it to the side, it will be helpful later on as a tool. as for the bearing, Pz designed a special method to remove this part, which i have to give kudos too. i even grabbed a picture of how he was doing it. what we did was rested one end of a hammer on the bearing, from the flange side of the housing, and just whacked on the other end of the hammer hard enough to remove the bearing, but lightly enough not to cause any other damage. after we finished removing the old crap parts of the speedometer housing, we proceeded to "goof off"
this is actually a pretty good de-greaser. we used it to clean up the rest of the speedometer housing, and remove grease, grime, and other unwanted stuff when working like this. you can use whatever brand of de-greaser you want, i just had to snap a picture of this out of humor as i didn't know of it's existence. after that's all taken care of, we should move on to what little work and notes there are to make about the axle flange itself. just a few things to keep in mind as we're at this step. this here is the speedometer magnetic ring. this is the equivalent of what's on the end of the axle that works with the abs sensors, but this tells you how fast the wheels are moving. theoretically, you can go ~130 with the car off the ground. i don't recommend it in any shape, way, or fashion as it's HIGHLY dangerous as the spinning wheels WILL generate enough momentum and force to knock the car off the jack stands and into/though WHO ever or whatever is in front of the vehicle. that's all thats to that. at this point, it may be a good idea to take the sensor ring off of the shaft, and "goof off" here as well, as xyro's was covered in ATF from the leakage. it just sprayed and covered the end of the flange. get that nasty goop off, just for the sake of a job well done. to the left of the shaft in that picture is that C clip which was earlier removed. just to give a perspective, and idea of what it is, and where it goes, it goes right on that notch you see on the axle shaft.the bearing pretty much sits flush on the flat plane of the shaft there between the sensor ring and the notch, and that's what holds the shaft to the bearing, and thus, to the housing, and from there, to the transmission. now then, on to the fun stuff. time to reinstall a NEW bearing! hopefully, you have bought a new bearing, i really do wish you have, otherwise there was much work wasted, and you could possibly be installing a new shaft seal on top of a damaged bearing, depending upon your method of disassembly. just install the new bearing the EXACT same way the old one came out. there should have been markings on one side of the old bearing, after you had removed it. install the new one into the housing in the same exact orientation. it's best to always install things the same way they were removed. now, the manual actually says for this step that you're supposed to take a heat gun, and heat the housing so that the metal expands, thus giving you more lee-way with the bearing's install. me an paul just stuck the bearing in the slot, and pressed on it. there was enough lee-way to begin with, that we had no problem just pressing it in with our own strength. no damage was done. if you want to be perfect about it, steal your sister, wife, or special other's hair dryer, and heat the housing. the method is up to you, but we just pressed it by hand. NOTE: bearings are just a couple of bands of metal suspended by those little balls! 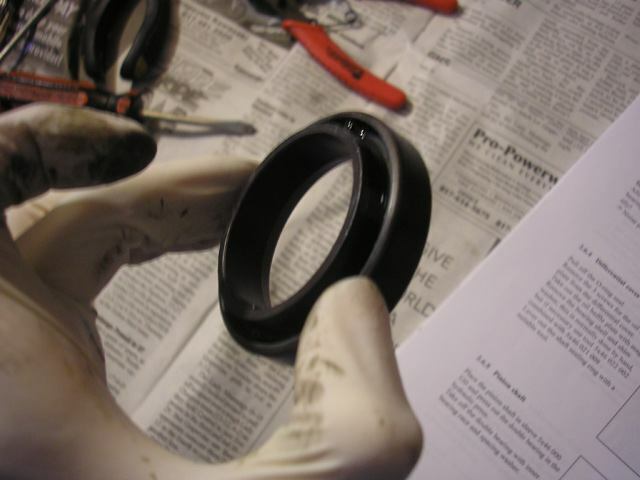 do not press too hard on either rings or you can damage, or burst the bearing!!! don't whack on it with a tool to get it in! just put your own weight evenly with your hands! stupid methods can result in damage. 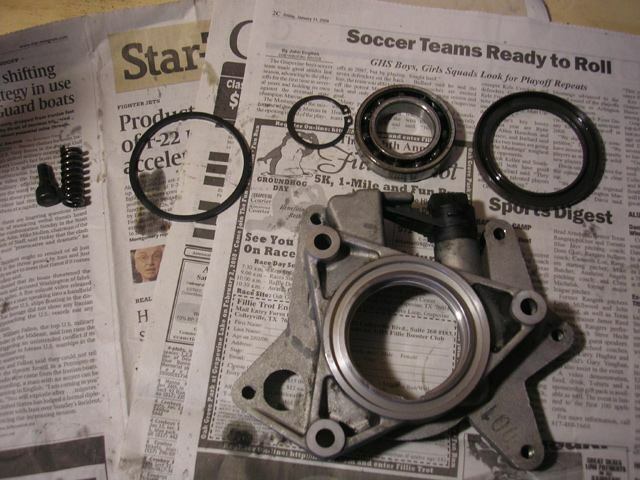 now, with the new bearing installed, we now install the new flange shaft seal, the purpose for this entire operation! yay! stick the new seal into the housing as shown above, and you can proceed to place a 2x4 piece of wood on top of the new seal to hammer/press it down into place. after the new seal is flush with the housing, it still has a bit of ways to go, so we place the old seal on top of the new seal to get it in that extra bit of the way. it is ok to hammer on the old seal, just be careful not to strike yourself, or the housing. also try to keep the seal as even as possible! with the new seal pressed all the way down, as far as it could possibly go, remove the old seal, and now it's ok to pitch the old seal into the trash. you will notice that the board is atop the old seal, which is atop the new seal in the housing. hammer evenly. now place the speedometer sensor ring onto the axle flange shaft, as it's nearly time to reinsert the shaft into the housing. before that, it would be best to spread a bit of grease lightly around the edge of the seal which will be directly touching the axle shaft. this will help it to keep from burning up upon initial use. highly recommended to do so. even something such as vasoline, or "trans-gel" (transmission lubrication gel used to goop certain things or hold check balls in place by high viscosity and thickness). now, i mean to lightly place a bead along the inner of the seal, i do NOT mean to pookey it completely up. just a light bead. 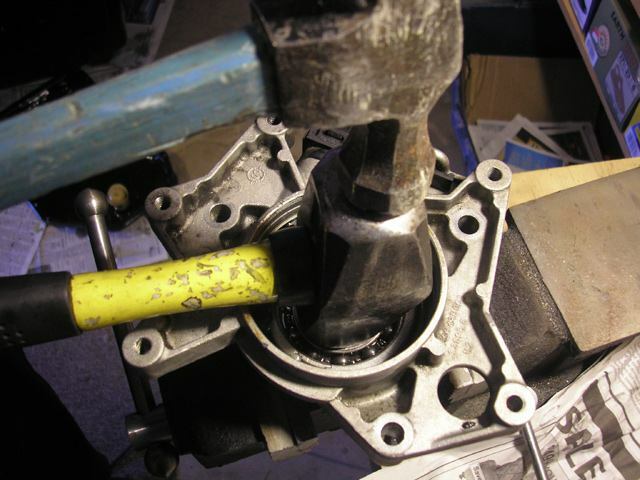 now, with that all taken care of, reinsert the shaft with the sensor ring in place, through the axle flange shaft seal, then through the bearing (stated for directional purposes) and once you get to where the bearing is resting on the axle shaft, STOP! 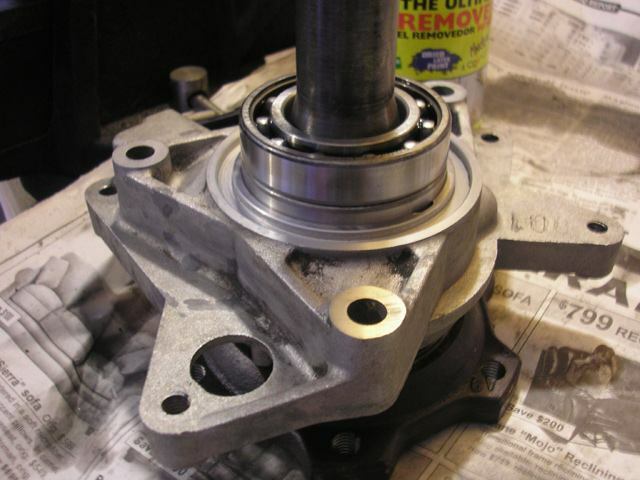 be sure to note how we placed the old bearing on top of the new bearing, which was left resting on the axle shaft. we had to do this to prevent damage to the new bearing in the coming step. the method we used to "press" the shaft into the new bearing, was to hammer on the flange (directly center) while we had the work-desk-clamp open enough, to where the old bearing was resting on the side of the clamps. the clamps were shut just enough to NOT grab the shaft, and rest the inner race (bearing inner ring) on the side of the clamps as well as the outer race. i was standing holding the assembly carefully in place as a helper. 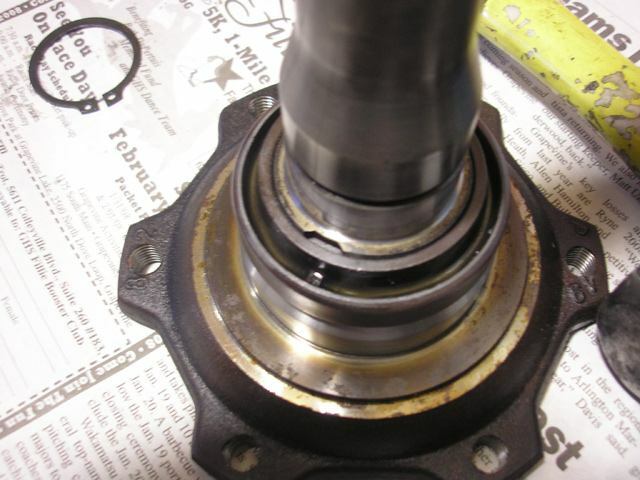 note how you can barely see light around the sides of the shaft, and how the bearing is resting on the old bearing, resting against the clamps. use this method HERE ONLY! 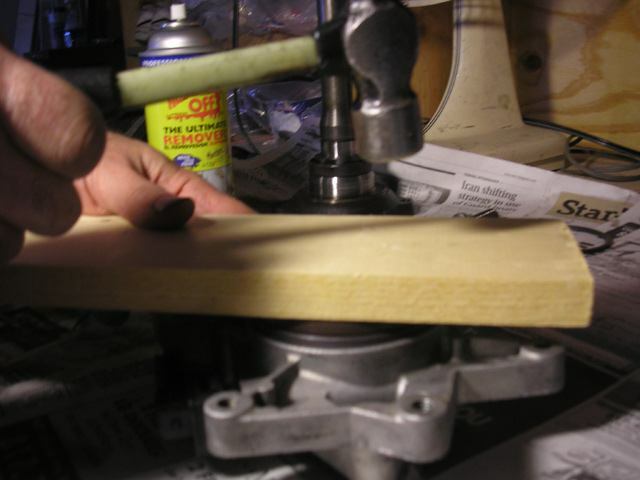 after you have the shaft "pressed" in to place, fully, you're next step is to place the new C-clip onto the shaft, and get it into it's notch. be very careful with this new clip! these things are very fragile, and if you open them too far, or bend them awkwardly enough, they can break, or stay dis-formed, resulting in immediate need for a new one. get it into it's notch, and then we're off to the next step. remember that pinion shaft bushing and spring we pulled out of the end of the axle shaft? well, it's time to place a new one back in. drop the spring, then place the bushing in, and put a bit of force on it, just to make sure it's in the proper position. moving on…. finally, it's time to place that new O-ring. the big ol' one which we had aside the entire time. this goes into that journal on the bearing side of the pedometer housing. yea, i know. it looks really awkward how it sits as loose as it is in there, but that's how it is. you're not the only one who hung back for a few seconds wondering "what the hell?". be sure to place a light film of oil onto this, just to help it stick to it's mate surface once the housing goes back onto the transmission. next step, we're almost there! take the assembly you've just completed back to the car now! 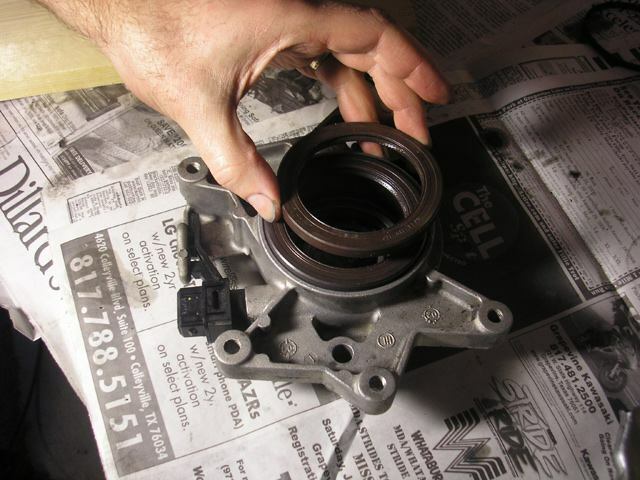 be sure to remember that position you removed the speedometer housing in, as you will need that exact position to get it back over the subframe rail. its a pain, but no engine or subframe manipulation will be required here either. after you get the speedometer housing over the subframe bar, get your head or a mirror with light in there to make sure the O-ring is still in place. if that gets crimped, it's game-over. get the speedometer housing back it's original position, as shown in the first few pictures for the removal. if it doesn't feel like it wants to go in all the way, turn the flange a bit, to get it to spline back up into the differential, encase you had met tooth to tooth, blocking you from installing it in all the way. and then reinstall the 3 t-40 bolts. each of these bolts will require a 23 Nm (newton meters) of force for them to be properly installed. 23 Nm only, no excess turning required. after those are back in, reattach the speedometer sensor wire, and re-zip tie whatever wire that is down there, to the housing, and to the next step. from here, all that's really left is the re installation of the axle. pop the axle back into place, put the end of it safely back into the wheel hub assembly, put the abs sensor back into position, bolt the axle flange to the axle flange shaft, install a new axle hub bolt and torque it. The outer axle bolt is 140ft/lb plus the 180 turn. for the sake of exactness, the outer bolt he refers to is the large bolt that is covered only by the wheel. after that, you should be in business! i highly recommend going over all work, checking for ANY misplaced bits, pieces, and bolts, to see if anything was missed. if all is well, then reattach the wheel, lower the car, and rock on!